Select from our variety of in-stock sheet metals for an instant quote on your box gutter job. Standard length is 10ft. If your job requires lengths of less than 10ft or materials not listed, please contact us for a custom quote. If you are a current customer, please log in to your account before building your quote. 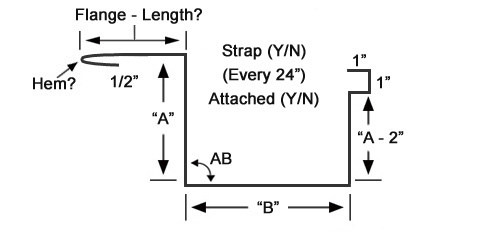 Box Gutter Specs Enter Side A and B lengths in inches converting your fractions of an inch to decimals. If side is less than an inch, enter leading zero.